Here are two of the most popular accessories at the Derringer Store - our Booksafe for securing your valuables and our custom made .410 shot ammo for the care and feeding of your American Derringer. To place an order, click the order button, and the ordering options will come up in a new window. All of our holsters and other accessories are available at the Derringer Store, just down the street from our factory in Waco, TX at 127 North Lacy Drive. Come on by...we'd love to see you! 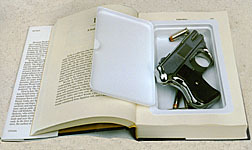 The Undercover Booksafe is a standard size book, but inside is a hidden compartment in which you can protect and conceal your valuables, including your American Derringer, from prying eyes and hands. The Undercover Booksafe can be kept right on your bedside table, added to your personal, library, kept in your office, or taken with you while traveling for that extra measure of security on the road. Only you will know the contents of this "best-seller." This ammo is manufactured expressly for American Derringer by Sellier and Bellot. The 3 inch long shells contain 5 balls of triple-0 shot in a plastic case with a felt wad. This is the ammo you need to feed your American Derringer. Manufactured exclusively for American Derringer by Sellier and Bellot. 5 rounds per package. © 2000-2011 American Derringer Corp.